Landstar Truckload services Offers Over 9,000 Owner-Operator Power Units and Over 15,000 Trailers of Various Types and Sizes. Reliable, safety-first coverage throughout the United States, Mexico, and Canada. Landstar's rolling stock inventory consists of over 10,000 53' Air-ride dry van trailers. Choose from 48' flatbed, step decks, to multi-axle low-profile double-drop trailers. View trailers. Landstar’s specialty-trained personnel are ready to coordinate your next temperature-controlled load. Landstar's business model attracts experienced owner-operators with safe backgrounds. Landstar’s owner-operators enjoy the freedom and support Landstar offers, which is why Landstar attracts among the most experienced and safest to haul truckload freight. Thanks to the hard work of Landstar’s owner operators, sales agents, and employees, company revenue continues to surpass $3 billion annually, while maintaining one of the lowest driver turnover rates in the truckload carrier industry. With a fleet and third-party capacity network the size of Landstar’s, 53’ air-ride trailer coverage is available throughout North America, and Landstar KCL Agency, exclusively affiliated with Landstar since 1997, is at your service and ready to coordinate your next shipment. Your Landstar truckload freight stays on the same trailer throughout its entire journey, which greatly increases reliability and drastically reduces the possibility of damage. All gateways in and out of Mexico are serviced by Landstar, along with dedicated through-trailer service from Canada and Mexico. More about Mexico shipments. Landstar truckload service specializes in Long Haul loads going from coast to coast and to Short Haul loads within the same city. Landstar provides climate-controlled trailers and logistics trailers outfitted to haul the most specialized, fragile items safely. If you would like to receive a rate quote, click here to submit a request. Landstar Trucking is the largest platform carrier in North America. With over 2,000 flatbeds and stepdecks available for service, Landstar the largest platform carrier in North America. Shipments of all dimensions and weights up to 160,000 lb. are safely and securely transported to destinations anywhere in North America on a timeline that fits your schedule. Landstar is an industry leader in the transport of High-Value Cargo, insurable up to $15 million, Hazmat, and Military Arms, Ammunition, and Explosives. Each of Landstar’s 9,000+ business capacity owners, BCOs, maintains an ongoing record of safe driving and Landstar’s 47,000+ third-party capacity providers all meet Landstar’s high approval standards. Landstar Trucking is a “safety before service” company, which is why so many companies and government agencies choose Landstar to haul specialized and high-value loads. Landstar knows load securement is of the highest priority when it comes to flatbed transportation. All Landstar drivers are trained on how to properly secure flatbed freight in order to achieve a safe and secure on-time delivery. Landstar also has a flatbed shipping services department with consultants ready to offer flatbed on-site securement consultations to help your organization maintain the highest level of safety. If you would like to receive a Landstar truckload rate quote, click here to submit a request. 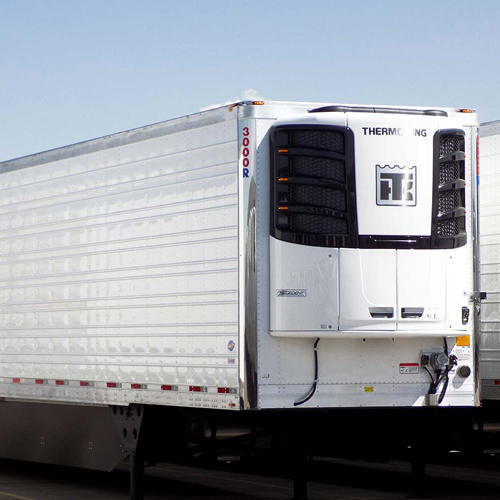 Landstar offers climate-controlled transportation services. Landstar will keep your cargo at the right temperature and deliver it on time, whether it’s a time-critical shipment of a human heart valve on it’s way to save a life, or long-haul truckloads of perishables. Landstar’s specialty-trained personnel are trained and ready to coordinate your next temperature-controlled load. Thanks to Landstar’s advanced technology and web-based load-tracking capabilities, status reports are available in real-time, giving you peace of mind knowing your important shipment is safe and on time. Let us know the details of your shipment, and we'll be back in touch with a rate quote.